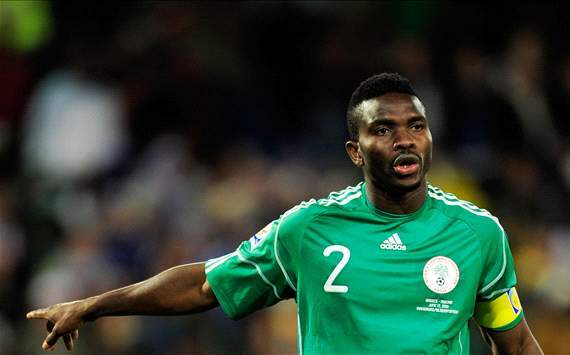 Injured Nigeria skipper Joseph Yobo has been ruled out of 2014 World Cup and Nations Cup qualifiers next month. The captain got injured in Wednesday’s Turkish Cup final game for Fenerbahce where they defeated Bursaspor 4-0. He was substituted in the 31st minute of that game. Nigeria coach Stephen Keshi will be looking to a replacement for the defence stalwart and is now expected to give a try to one of Gege Soriola, Godfrey Oboabona and Papa Idris. Yobo’s absence is a massive blow to Nigeria because he has been one of the most consistent performers for the national and he has been a big source of inspiration for the new team Keshi has been building since he took charge in November. Yobo, who has featured at two World Cups, has been solid in the heart of the defence and often wanders into attack to score crucial goals. Lille goalkeeper Vincent Enyeama is now most likely to captain Nigeria for the qualifiers as he is the national team vice-captain. The highest capped player in Nigeria history, Yobo has been the strong man in defence for the team for a decade.